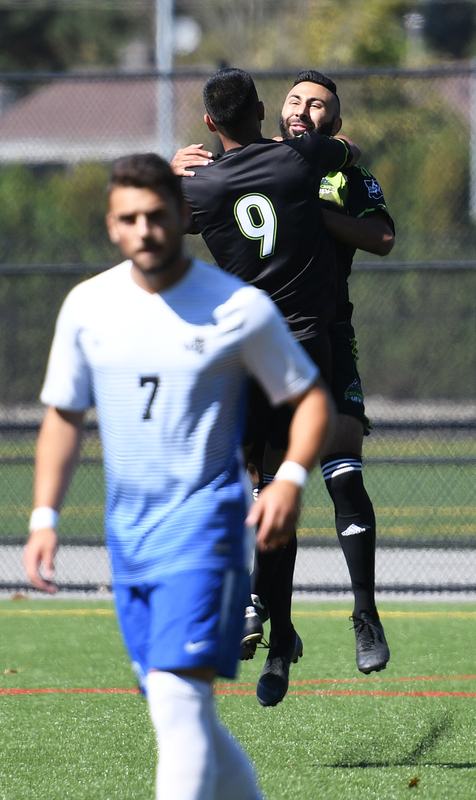 Gurmaan Jhaj lit the fuse for the University of the Fraser Valley men’s soccer team on Sunday afternoon, sparking the Cascades’ most prolific offensive performance in nearly two years – a 4-0 home win over the Victoria Vikes. Jhaj racked up two goals and an assist, Parman Minhas and Andrew Peat scored singles, and goalkeeper David Hicks made two saves for the clean sheet as the Cascades improved to 2-1-1. 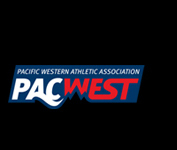 The Vikes, meanwhile, return home from their season-opening visit to the Valley with an 0-2-0 record, having also sustained a 7-1 setback at the hands of the Trinity Western Spartans on Friday. Gurmaan Jhaj celebrates with teammate Sahil Dhindsa (9) after scoring the game’s first goal in the second minute of play. Jhaj, a fourth-year forward from Aldergrove, B.C., helped the hosts seize the early momentum. After Parman Minhas was taken down just outside the UVic penalty area, Jhaj stepped up and curled a picture-perfect free kick into the top corner, far side, just out of the reach of Vikes rookie goalkeeper Harjot Nijjar, who was making his Canada West debut. The Vikes looked to reply in the 13th minute, but Matteo Ventura’s effort from just beyond the box went high and wide. Minhas made it 2-0 Cascades just before halftime. The sophomore forward eluded multiple Vikes defenders on his way from the left edge of the box to the centre, where his initial shot was blocked. But the ball bounced right back to him, and he volleyed it home. Peat, a rookie forward from Port Coquitlam, B.C., notched his first goal as a Cascade in the 50th minute to put the game all but out of reach. Jhaj lofted a lovely free kick, and Peat nodded it past Nijjar. The Vikes found some traction offensively at that point, but were unable to connect. Rees Goertzen registered UVic’s first shot on goal in the 55th minute, but Hicks dove to his left to get his fingertips on the ball and deflect it off the bar. 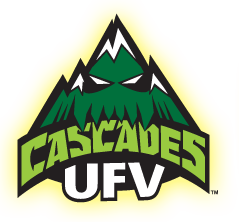 The Cascades fifth-year keeper came up with another nice stop on Vikes defender Evan Libke in the 82nd minute to preserve the clean sheet. Jhaj rounded out the scoring in the 88th minute on yet another set-piece success for the Cascades, heading home Brady Weir’s free kick. Sunday’s outburst marked the first time the Cascades had scored four goals in a Canada West game (regular season or playoffs) since Oct. 7, 2016 when they defeated the Trinity Western Spartans 4-1. 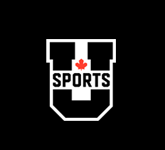 Additionally, it was their largest margin of victory in conference play since an 8-0 win over the Mount Royal Cougars on Oct. 27, 2012. “It’s been a while since we’ve scored four goals in a game, so it was obviously nice,” Cascades head coach Tom Lowndes noted. “I think if you watched the first half, it was a bit of a slower-paced game – I think Friday (a 1-1 draw with UBC) took a lot out of us intensity-wise and physically. I didn’t really realize until the game started how much it took out of us . . . but I thought we controlled the tempo of the game pretty much for 90 minutes. We looked dangerous on the counterattack again, and probably could have scored a few more. 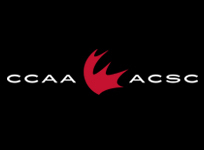 The Cascades are on a bye this week, and return to action on the road the following weekend, facing Mount Royal (Saturday, Sept. 15) and Alberta (Sunday, Sept. 16).